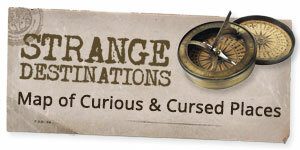 On the evening of March 24th, 1906 an unmarked trunk left at a train depot in Stockton, CA began to draw suspicion when a foul smell was traced to it. Police were summoned and the trunk was pried open to reveal the lifeless body of Albert N. McVicar. The press went crazy and McVicar’s autopsied remains were placed on public exhibition at the city morgue. The autopsy and chemical analysis of McVicar’s organs revealed the cause of his death was morphine overdose. His body contained ten times the amount of morphine needed to kill a healthy male of McVicar’s size. His wife, Emma LeDoux, was a known morphine addict with a history of ex-husbands and other unsavory things. 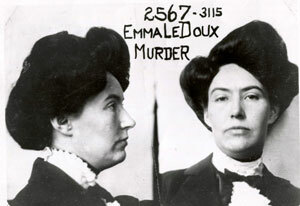 Despite delays due to loss of witnesses and evidence during the great San Fransisco earthquake on April 18, 1906, Emma was eventually found guilty of first degree murder and became the first woman to receive the death penalty in California. Before she could get the distinction of being the first woman legally hanged in California, Emma’s sentence was reduced to life in prison due to suspected jury tampering. She served ten years before she was granted parole in 1920, but soon returned to prison and spent the rest of her life in and out of the big house for various petty crimes until her death of ovarian cancer at the age of 69. 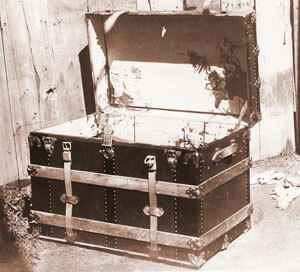 The trunk Emma used to dispose of her husband’s body is now on display at the Haggin Museum in Stockton, CA. Even back then criminals were getting away with it. Especially women.